Governor of Poker is an installment from Teyon gaming and it is a portable poker game built mainly around Texas Hold ‘Em but with a narrative running concurrently to the poker games. In Governor of Poker, the ‘Governor’ owns every building in sight and therefore runs the county, in this case, Texas. Players pile into the buildings to play poker for the chance to move up rankings, eventually earning the chance to play for the Governorship of Texas. A nice thought and relatively interesting storyline but not one that is going to win any awards for script writing. The game play is smooth and well thought out with everything you could possibly want to view, visible immediately from the game screen and the difficulty can be customized to three different levels, allowing players of any ability to enjoy a game at their level. If players have never played poker before there is a tutorial version as well that walks rookies through the main aspects and nuances of Texas Hold ‘Em poker. Players are aiming to win as much money as possible when they play poker in this game. Tournaments pay out if players finish in a high enough position but the most entertaining game play is in the cash games where players can wager as much cash as they want, or have, and can even wager towns that they have acquired if they’re feeling particularly confident on a hand. Once players have amassed a fortune, the idea is to buy towns in the county until you own everything, and therefore rule the county by possession. When you own buildings you will start to receive rent payments and you can purchase transportation to get you to the next town, so you can purchase all of their buildings as well. 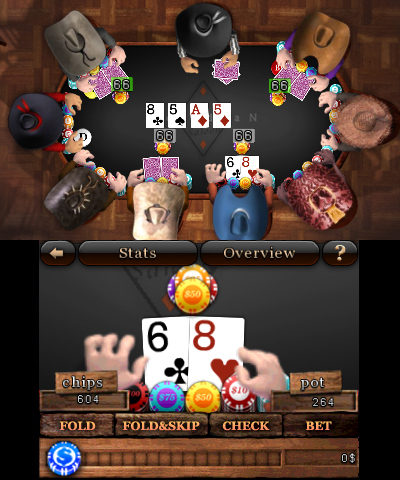 Governor of Poker for the Nintendo 3DS is a slightly unusual poker game as it seems to combine the obvious Texas Hold ‘Em aspects of game play with an almost Civilization style entrepreneurialism and RPG features bolted onto the side. All of these additions to the game play do make for a fairly absorbing game, however, the characters and situations in the game could have been adorned with far more personality which would have certainly increased the feeling of involvement for players and generally made the game feel far more absorbing. Because of this lack of personality, the game can drag somewhat if you aren’t much of a poker fan. The narrative and storyline does help to entice non poker lovers but it certainly won’t keep them playing. Governor of Poker is more one for the poker lovers that want something slightly more than the regular hand after hand after hand of regular poker games. All in all, the game play is smooth and fast paced and the storyline does provide some justification and motivation for beating the AI poker players but it won’t be beating the likes of grand theft auto for any narrative prizes.